L Care home residents in Aberystwyth have been enjoying music that has a personal resonance for them at a special event ahead of Welsh Language Music Day on February 8th. istening to your favourite music lifts your spirits, whatever your age. That's why Bangor University and Merched y Wawr are launching an appeal on the Welsh Language Music Day, for people to get in touch and suggest their favourite Welsh language songs from all times. 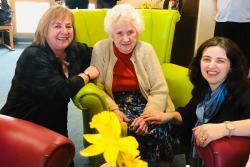 Dr Catrin Hedd Jones visited Hafan y Waun Care Home, in Aberystwyth which provides residential and specialist care for up to 90 people at one time living with dementia, in advance of Welsh Music Day. The care home residents have been enjoying music that has a personal resonance for them at a special event ahead of the special day on February 8th. Alistair O'Mahoney a School of Music & Media student has an internship to complete the project, which is funded by the University’s Centre of Ageing & Dementia Research, Merched y Wawr and the Welsh Music Day. The intention is to work with the record label, Sain, but also to use some rare recordings from the Bangor University Welsh Pop Archive collection, which is in the School of Music and Media. It is intended to launch the finished CD later in the year. The project welcomes favourite music suggestions in order to prepare a short-list. You can send an e mail to Alistair: canygan@bangor.ac.uk , call Dr Catrin Hedd Jones on 01248 388872 or contact via social media, a new Twitter account has been created: Cân y Gân @CnYGn1 or via the North Wales Dementia Network Facebook Group. Dydd Miwsig Cymru celebrates all forms of Welsh Language music with free events aimed at gig goers, parents and children, young people, students and businesses are happening across the country. Follow @cymraeg and #DyddMiwsigCymru on Twitter, Facebook and Instagram for the latest details on plans for the day.